These are definitely not your typical cookies, they’re more like mini tarts, but are cookies nonetheless. I tried to do some research as to how a tassie got its name and what the difference was between a tassie and a cookie cup, but, I came up empty handed… Oh well. If anyone knows feel free to share it in the comments sections below! These weren’t on my original list of cookies for this week, originally I was planning on an Earl Gray Tea Cookie that called for cardamom. Cardamom became the main flavor of the cookie as opposed to the titled earl gray and while that was fine as the cookie tasted good, after making the cookie 2 different times – following the directions exactly the first time and making some variations the second time – both times the cookie came out too dense. I knew then that the recipe was a fail and searched for something else. Hence these tassies and cookie cups, both of which turned out to be a major hit. On a side note, I had a second fail with another cookie recipe as well. It was for a Maple Pecan Chocolate Cookie that called for maple sugar. I had to do some searching for the maple sugar and while the cookie dough – yes, I eat raw cookie dough from time to time – tasted delish with a maple flavor the cookie itself lost the maple flavor and was flat, chewy in the middle and crispy along the edges. Not at all what I was expecting. I read the directions numerous times afterwards to make sure I added the right amount of ingredients and such and I had. I wonder if anyone tests some of these recipes before publishing them sometimes. Back to the cookies at hand. When I initially made them I didn’t want to make too many – each recipe calls for 24 – just in case this was another fail. But, after friends tried them it was evident that I needed the full amount so I made them again for Thanksgiving and once again they were a hit. 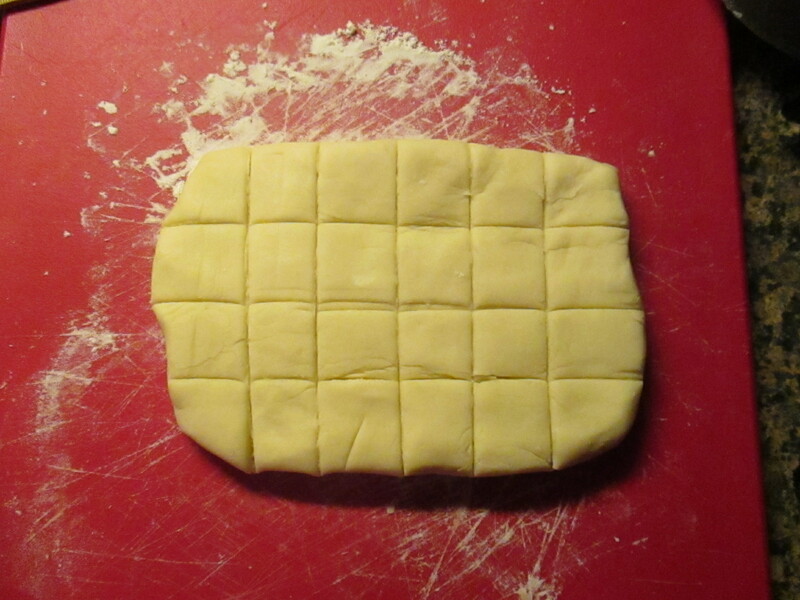 To help divide the dough into 24 somewhat evenly balls I formed the dough into a 6×4-inch rectangle on a lightly floured surface and cut it into 24 squares. I began by scoring it with a pizza cutter and then actually cut it once it had all been scored. For the Pistachio Cookie Cups to save money, but not time, I opted to buy roasted unsalted pistachios in their shells and shelled and chopped them myself. Which I then mixed with an egg, confectioners’ sugar and chopped dried apricots for the filling. Since key limes aren’t always available in my area and I do love key lime pie, I usually have key lime juice in my fridge. You can find it in the juice aisle or oddly enough at some supermarkets they have it in the baking aisle. I can’t say for sure if using the juice from key limes as opposed to regular limes alters the flavor of the tassies since there are other ingredients involved, but, I do know that there is a difference in the flavor between the two of them. It’s all about preference and authenticity to the recipe when it comes to which lime or lime juice you choose. 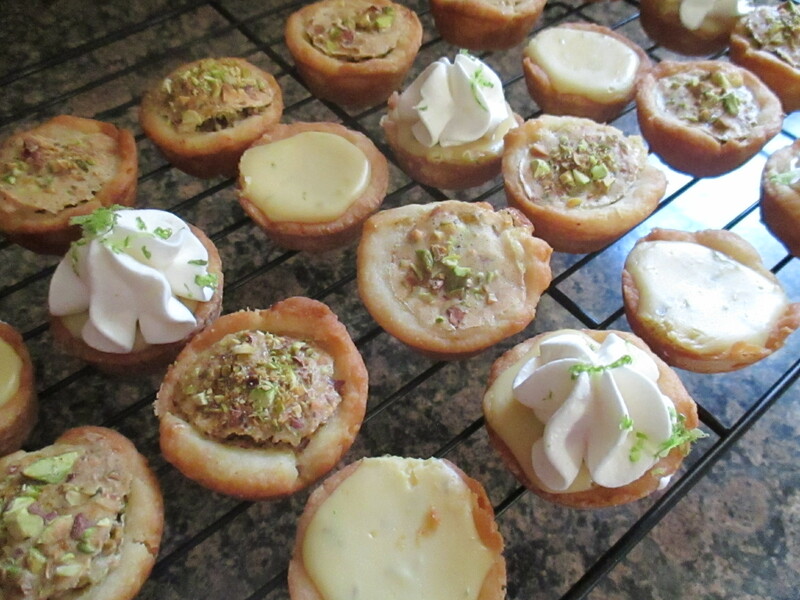 The Pistachio Cookie Cups are baked filled while the Key Lime Pie Tassies pastry cup is baked first and then filled with the key lime filling and then baked again. Don’t worry, the pastry cup won’t burn or dry out… that’s what I initially thought would happen. Both of these are delicious and it’s hard to choose a favorite and thankfully they are easy enough and quick enough to bake that you could bake them both to enjoy them at the same time. 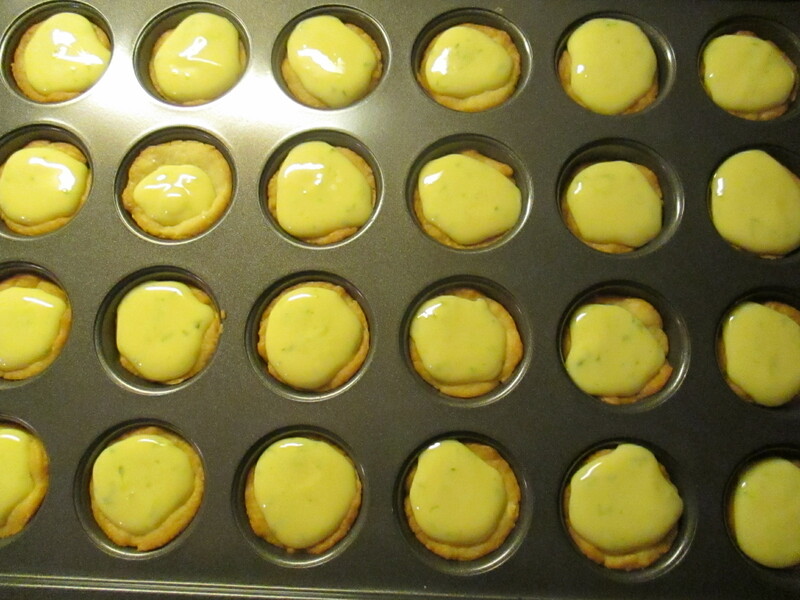 And while the Key Lime Pie Tassies are good on their own, I decided to add a little homemade whipped cream and lime zest to some of them for a little more sweetness. Preheat oven to 350 F. In a medium bowl beat the butter, cream cheese and sugar with a mixer on medium speed until smooth. Beat in the flour and orange zest. 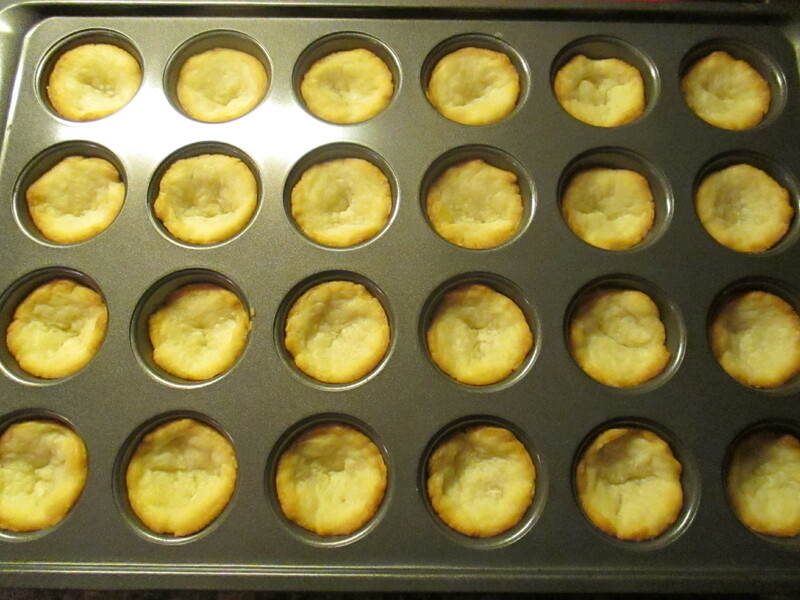 Shape the dough into 24 balls and press onto the bottom and sides of mini muffin pan. 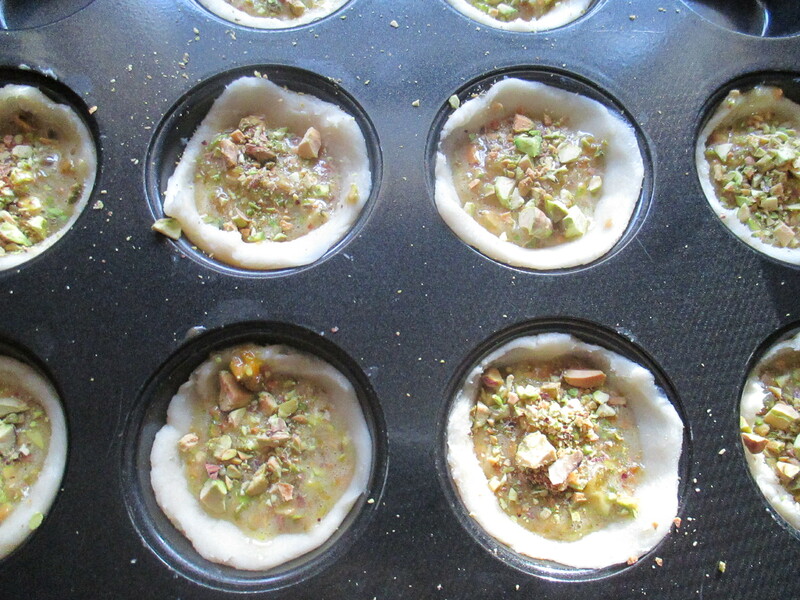 To make the filling: In a small bowl combine the egg, confectioners’ sugar, 1/3 cup pistachios and the dried apricots. Spoon into the pastry-lined mini muffin tin. 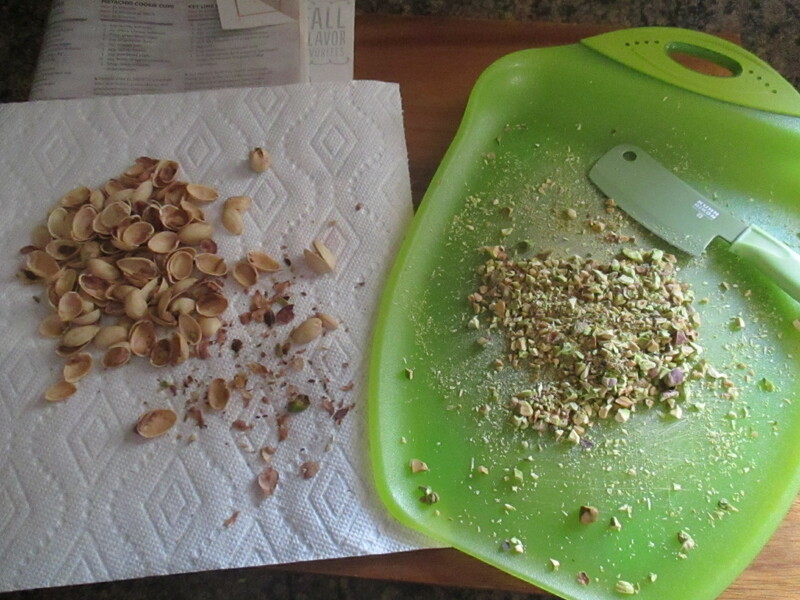 Sprinkle remaining chopped pistachios over them. Bake 18 to 20 minutes or until the pastry is golden brown and the filling set. Cool in the muffin tin on a wire rack for 10 minutes. Remove from the pans and cool completely. Preheat oven to 325 F. In a medium bowl beat the butter, cream cheese and sugar with a mixer on medium speed until smooth. Beat in the flour and orange zest. Shape the dough into 24 balls and press onto the bottom and sides of mini muffin pan. Bake 20 to 25 minutes, or until the edges are golden brown. Cool slightly in the muffin tin on a wire rack. Make the filling: In a medium bowl beat the eggs with a whisk. Gradually whisk in the condensed milk. Next, whisk in the lime zest and lime juice. Spoon about 1 tablespoon of the filling into each pastry-lined cup. Bake about 10 minutes, or until filling is set. Cool in muffin tin on a wire rack. Cover and chill for 2 to 3 hours. If desired, top with sweetened whipped cream and additional lime zest. Sweetened Whipped Cream: Beat 1/2 cup heavy, 1 tablespoon confectioners’ sugar and 1/4 teaspoon vanilla extract with a mixer on medium speed until soft peaks form.